Nothing says congratulations or thank-you like a beautiful bouquet of white flowers from Stonehaven Flowers. Our stunning hand-tied bouquets are guaranteed to make an impact on any occasion. Each bouquet created by ourselves is handled with the greatest care and love we believe it deserves. The Expert Stonehaven florists boast a wide range of experience, and their skills are nothing short of excellent. White flowers are the perfect way to create an elegant touch to you or your loved ones special day. 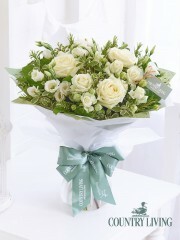 Stonehaven flowers classic large-headed white rose are always the perfect gift. Each bouquet is hand-tied by our Expert Stonehaven Florists often with the finest eucalyptus and salal leaves. We have an extensive range of white crisp flowers available at Stonehaven Flowers including white lisianthus, stunning white oriental lilies or perhaps you would like to order some beautiful white lilac. Whatever your choice our Stonehaven Florists are on hand to help. If you decide that our vast online range doesn’t have exactly what you were looking or hoping for, one of our florists at Stonehaven Flowers would be more than delighted to arrange a bespoke bouquet. Our bespoke can be tailored to the preferences of you or a loved one, including possibly their favourite white gerbera. Our white flower range at Stonehaven flowers can help create a simple yet sophisticated impression on any occasion. Our stunning white flower arrangements with their elegant looks can be the perfect centrepiece for a wedding reception or as a congratulations. 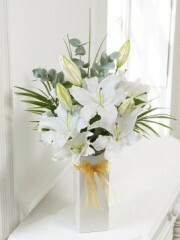 Stonehaven Flowers offers a range of gifts to accompany your magnificent bouquet. You may like to choose from a selection of our delightful champagne, indulge in one of Stonehaven flowers delicious boxes of chocolate or choose from our fine wines. All our accompanying gifts makes your bouquet just that little extra special and truly creates the impression of a heart-felt gesture. The Expert Florists here at Stonehaven Flowers are always delighted to please. We want you or the one you have in mind to achieve the highest levels of satisfaction from your bouquet. There is an excellent range of delivery choices made available for you by Flower Delivery Stonehaven. Our Stonehaven flower delivery team offer a fabulous Same Day Delivery service. Ensuring that your order is placed with ourselves either over the phone or online by 3pm, you can have your marvellous bouquet delivered to your chosen destination on the same day. Our other Flower delivery service is our standard next day delivery service offered by Stonehaven flowers from Monday to Saturday. We give you the flexibility you choose when you wish for your flowers to be delivered. Stonehaven Flowers have time slots available before and after 1pm meaning you are in charge of when Stonehaven Flower Delivery send your flowers to you or your loved one. At Stonehaven Flowers we can reassure you that our Expert Stonehaven Florists take utmost pride and pleasure in every special arrangement we make and these exquisite white flower bouquets, with their simple colours yet classy design are guaranteed to please. Stonehaven Flowers enjoy bringing happiness to you and your loved ones on any given occasion and are certain to make your time ordering with us remember able.